Leaving from Belgrade, friends Cvjetko and Pavle had covered almost 1000 km hitchhiking. They had been stuck in Verona, though, for a whole day: not one car had stopped for them. Verona was therefore marked with a black dot. In the evening, tired and disappointed, they decided to sleep in a nice park with soft green grass. The next morning they were awakened by people screaming and gesturing. They all seemed angry. The two students were still in a daze and had to look around them to understand what was happening: they were nose-deep in water, their sleeping bags were soaking wet and heavy and their backpacks were floating beside them. The two hastily collected their things and ran away. In the '70s, even those who had money preferred to hitchhike. It was a must, for the children of such a rebellious generation. And so, in 1970, Cvjetko and Pavle, two students, went around Europe before reaching the English Isle of Wight, where the rock festival that would make history was under preparation. Today, 43 years later, my friend Cvjetko still remembers all the details of that trip. He recalls particulars with precision, knows all days, dates, places, people and names by heart. I so love the story of that trip that I ask him to tell it to me again. When I was listening to him for the umpteenth time, a while ago, I realized that the park near Verona where they slept that night was actually a rice field. “Oh, what fools! Had I died yesterday, I would have never known I slept in a rice field!”, Cvjetko laughs. Leaving Verona, the two hitchhiked their way to Switzerland. In Geneva, they slept in the English Garden, the elegant park in the city center. The next morning, a policeman politely awoke them and asked them to get up. It was the 14th of July of 1970. He remembers that well because the French were celebrating their national holiday, the Storming of the Bastille. They started hitchhiking again. It was too hot, there were few people around, few cars passing by. After a while, Pavle fell asleep on the side of the road while Cvjetko, sitting on a road sign, was eating cheese. A brand new Fiat 124 quickly drove and caught him by surprise. Cvjetko lifted his thumb at the last second, the car abruptly stopped with a shivering noise – smoke blew from the wheels because of the friction – and backed up. In the car are two guys with long hair and long beards. They inquire Cvjetko and Pavle as to who they are, where they are from and what they do. “Yugoslavia, Balkans, Tito”, a few common stereotypes rouse their curiosity. They observe and listen to the two students as if they were some exotic rarity. Then they talk while listening to a tape and a song topping all charts at the time: “Light my Fire”. The dude sitting next to the driver turns and asks the two passengers if they know the song. “Of course”, answers Cvjetko, “It's by José Feliciano, the blind singer from Puerto Rico”. “No way, you fool! I wrote this song!”, the dude says and bursts out laughing. It was Jim Morrison with his manager, Leon Barnar. 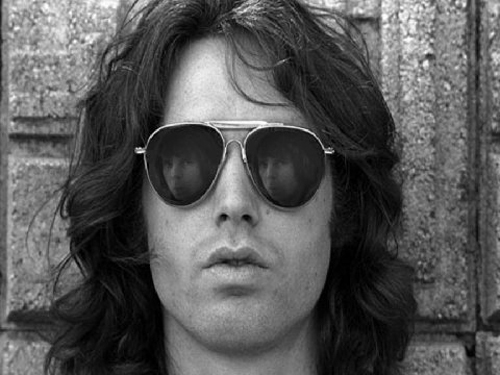 The two students knew The Doors, they knew who Jim Morrison was, but they had not recognized him. At that time, the youth in Yugoslavia knew about all the current music though Radio Luxembourg, which broadcast all the latest hits on a night program. They drove all night and at 4 o'clock the two students woke in front of the Hilton hotel in Paris. Jim and his manager offered to pay for their rooms. However, with their clothes that in the meantime had dried up on them, feeling dirty and smelling of rice field, the two did not feel adequate for such a luxurious place. They refused. They accepted, however, to stay a whole week at Leon Barnar's apartment in Rue des Plantes, in South Paris. Twenty days later, the travel companions met again on the Isle of Wight: Jim Morrison on stage and the two students watching him from the crowd. At the time, the word “Yugoslavia” was like a symbol or a key opening many doors. In Paris, they met some girls who – as if holding trophies - introduced them to their parents, a group of left-wing French intellectuals enamored with Socialist Yugoslavia. They invited them to a sumptuous dinner with wine, cheese and many pats on the shoulder and, again, “Yes, yes, Yugoslavia, Tito, Communists, Balkans!”. Then, off to London through the English Channel. The two joined young people from all over the world, hippies, the peace and love generation, who could be spotted easily: long hair, long beards, smiles on their faces, colorful and flowery clothes, their fingers lifted in the V gesture. They moved in groups. A well-informed German led them to Mick Jagger's house. The Rolling Stones singer lived on 48 Cheyenne Wolk, his Bentley parked outside. They rang the bell, as if to enter a friend's house. Mick answered, pretended to be someone else and told them Mick was not home. That did not work, though: they recognized his voice and begged him for two hours to come out. Irritated, Mick came out. In the music world he was a mogul, but physically he was rather thin, his shirt was unbuttoned, his pants tight, making his legs look like bread sticks. They chatted, took a group picture and then the fans moved to another part of London to meet another one of their idols. Outside the Apple Studios, about 60 “regular” admirers were waiting for George Harrison, who was then working on his new album, “All things must pass”. He arrived on a Mercedes 600. Cvjetko recalls that only President Tito had that limousine in Yugoslavia. Harrison had long hair and a long beard and was wearing a purple suit. He stopped to talk to some fans, he knew them all, called them by name; he asked a girl if she had passed her exam, another one how her Grandmother was. They spent their time going to concerts, visiting museums, going to the theater to see the famous show “Hair”. The Isle of Wight festival was approaching, so they were off to the South, again hitchhiking. The word “Yugoslavia” worked in England, too. A car stopped: it was going their way, but not up to the coast, but when the driver learnt that the two students were from Belgrade, the car changed route and took them to the port. They slept on the beach near the port. The next morning, a policeman kindly awakes them He went by once to check if they were up, then a second time and a third time, when he lifted the sleeping bag and emptied it. Later, another policeman came to the rescue and accompanied them around for a couple of hours looking for a place they could exchange their money. The two got to Wight early, but not among the first. There were people who had been there for three days waiting for the festival to start. A whole Swedish village, for instance, was there with their entire families, small children included. They organized themselves as if in a community, they cooked and ate together, everyone chipping in with what they had, they worked for free to prepare the stage and the whole venue for the concert. Cvjetko and Pavle thought they would be the only two Yugoslavians on the Isle but, among the thousands of people, they met a couple from Zenica, Cvjetko's birth city. Today Ismet Huta Berbić and his fiancée Hika – that couple - are both doctors and are married. They also met Petar-Peca Popović from Belgrade, who has since become one of the Country's most renowned music critics. With the 26th of August approaching, the crowds of attendees followed in ever shorter intervals. They came in thousands. The day before the start of the concert, it looked as if the Isle was about to sink under the sea of people. The organizers had been expecting 150.000 people, but there were 600.00 on Wight. No one was checking the festival program anymore, no one asked for extra tickets: everyone was just focused on trying to avoid collapse and serious accidents. Fortunately, it all went by without great difficulties. But to avoid similar future mishaps, the British government passed a law (the "Isle of Wight Act") according to which gatherings with more than 5.000 people were not allowed on the Isle without a special permit. There was a lot of free love, alcohol, drugs but, most of all, live rock music. The festival had been conceived as a copy of the famous 1969 Woodstock concert, but the event on the Isle of Wight exceeded the original. The concert was one of the largest musical gatherings ever organized worldwide. The Wight festival, though, did not go down in history because of the number of people attending, but because of the musical legends performing. Substance made the concert memorable. Performing were celebrities such as The Who, Jimi Hendrix, Miles Davis, The Doors, Lighthouse, Ten Years After, Joni Mitchell, The Moody Blues, Melanie, Donovan, Gilberto Gil, Free, Chicago, Richie Havens, John Sebastian, Leonard Cohen, Jethro Tull, Taste and Tiny Tim, Joan Baez, Emerson Lake & Palmer. Something really special was going on in the world in those years and music had the power to unite people. After almost two months wandering through Europe, Cvjetko and Pavle decided to go back home as kings. No hitchhiking, but flying. At the airport in London, they boarded a DC, one of those old airplanes that looked like they were made as today's beer cans. The two did not have a ticket. “Controls were not so rigorous, at the time”, recalls Cvjetko. “There were many people around and we sneaked in with them. The only problem was cabin pressure. It hurt me so much that I never got on a plane again for 20 years”.